I would have said that this shot gives a better impression of the true character of the plant if the one in the back didn’t seem to be wearing a superman cape and keeping a watchful eye on a couple of conspirators in the foreground. It’s a Helleborus x hybridus, which means it’s one of the many thousands of modern plants that have resulted as a natural or deliberate cross between species. As this wide landscape shot shows, it has formed a sturdy, well-established clump full of flowers. One bloom – the one twisted upwards and balanced on the shoulders of its neighbours – seems to testify to the hand of a photographer who was here before me and also wanted to look inside. I tried a snail’s eye view too and captured this atmospheric shot of the blooms. The nodding design of the flowers protects the pollen which would otherwise be blown or washed away by harsh winter weather before pollinators could do their job. I checked the time stamps on the pictures and discovered I spent two minutes on the clump, then returned later for the close up shots, all taken within the same minute. Five minutes can clearly be a long time when it comes to photography. Here’s a slightly different take on the flower I started with, showing the bloom in its context. You can see the upwards facing flower in the background. 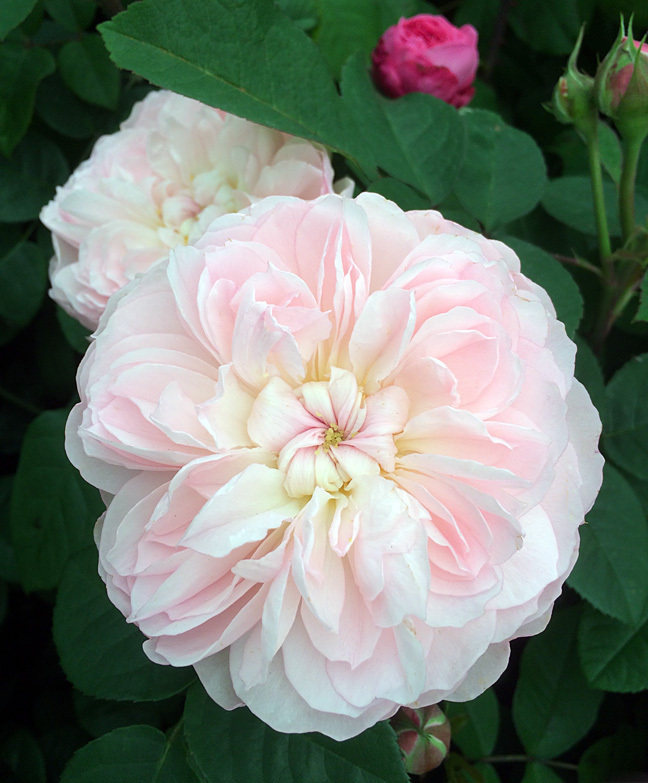 You might have noticed that the petals are slightly rounder and more wavy at the tips than the flowers in the main clump with their sharply pointed petals. Not by much, but enough to suggest this could be a slightly different Helleborus x hybridus on the edge or in the middle of the clump. If it’s a stray seedling, it’s a particularly beautiful one. These pictures were taken at Gresgarth Hall Gardens, home of designer Arabella Lennox-Boyd. I would love to see Gresgarth in winter. Where did you find the hellebores? I’d love to see it in April or May, when the blossom is out, but I never seem able to manage it. The gardener says that’s his favourite time. This clump was in one of the borders between the river and the lake. There is an informal double border of hellebores just outside the walled garden (with a few chickens living in it!) and more in borders close to the house. You’d like seeing the walled kitchen garden at this time of year and all the things carefully wrapped up for the winter. Worth lifting the “skirts” of those lovelies to get a shot of their pretty little faces. (I know! I’m mixing and mangling metaphors.) Focus so long on one subject really trains you to look, an essential part not only of photographing, but also of writing, drawing, and painting. I remember being roundly teased for drawing an elephant with its ears coming down from the top of its head rather than the sides and realising I hadn’t really looked at one properly. Mind you, I’m not sure the drawing would have been much better even with the ears corrected. I once rode on one when I was very small with other children on a wooden saddle. You’ve reminded me of your post about learning the one handed approach to flower photography. It’s easier with a hellebore than a snowdrop! Yellow snowdrops seem especially tricky to look inside – too narrow, perhaps. I keep ending up with a tantalisingly blurred yellow snowdrop and such clear finger prints I could be framed for a robbery. I like them when they are planted in a raised bed or wall so you can get a glimpse of their hidden beauty. I read somewhere about trying to breed some with their heads raised, but wonder if they would suffer damage by the rain in our climate. I love snails’ views even though they feel slightly dodgy if we anthropomorphise the flowers! I have been known to use sticks to prop hellebores up discreetly for photo shots. Anyhow, nice shots and the veining is pretty interesting. I haven’t had enough hellebores to practice on! I tried sticks on roses and could never get it to work, although you can sometimes loop the heavy ones over an adjacent twiggy bit to get a better view. Gorgeous! I do like the snail’s eye view shot, because it makes them look like they’re as much gathered round you having a look as the other way around! I don’t think they mind being tipped up for a moment to be adored! I know I wouldn’t! I’ll try the snail’s eye view again. You were too early to see Oddment’s comment – she thinks the whole clump must have lost something and are looking for it. Lovely, no matter the perspective! I always take a few shots of any flowers I see at their prime. The difficulty usually is in deciding which one to share. That’s one of the things that makes RegularRandom fun – you get an excuse to splurge! Susan, I’ve never seen double hellebores before, and they are absolutely beautiful! 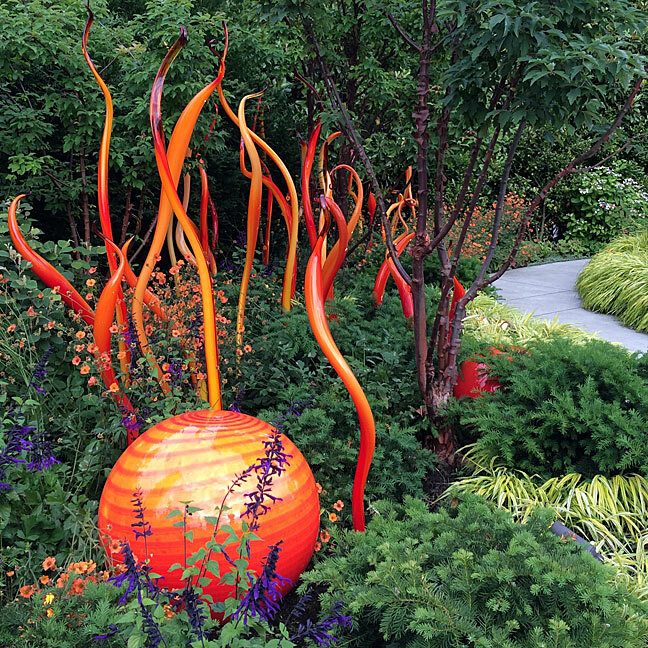 They often seem to be really good, sturdy plants too. Hehehe time is never squandered when photographing flowers and these are beautiful. I probably would have been lying on my belly to shoot upwards lol. I tried that the other day for the first time since surgery and discovered that it’s very difficult to get up! Lovely series Susan and I love your words that go with these shots too. At least you feel strong enough to try! I hope you are soon fighting fit again (no – make that photographing fit). It was a bit wet for lying down, as my muddy knees would have testified. Such wonderful color! Nice to read your process of taking these photos as well. I couldn’t decide if the colour was red or purple. Hellebore red is really just a step in the direction of red. This was a laugh-out-loud for me. I never trust a flower that won’t look me in the eye, so I would definitely be one to take the snail’s perspective. Regarding the whole clump, I’d swear they all lost something. I seem to hear “now where did that go?” but perhaps I’m projecting. Thanks for pointing out the differences in petals — lovely contours which I’d otherwise have missed. They all lost something is perfect. That explains the one looking skywards. I’m glad you gave us a view of the interior of the flower. It’s beautiful. Also I didn’t realize they were so small until I saw your fingers in relation. It’s a win-win. Great shots! But how can you NOT want to see the inside. They’re so beautiful! I do want to look inside but there’s a part of me that thinks I ought to show the flower as it naturally is. Would they grow well in Utah do you think? I wouldn’t like to guess that. 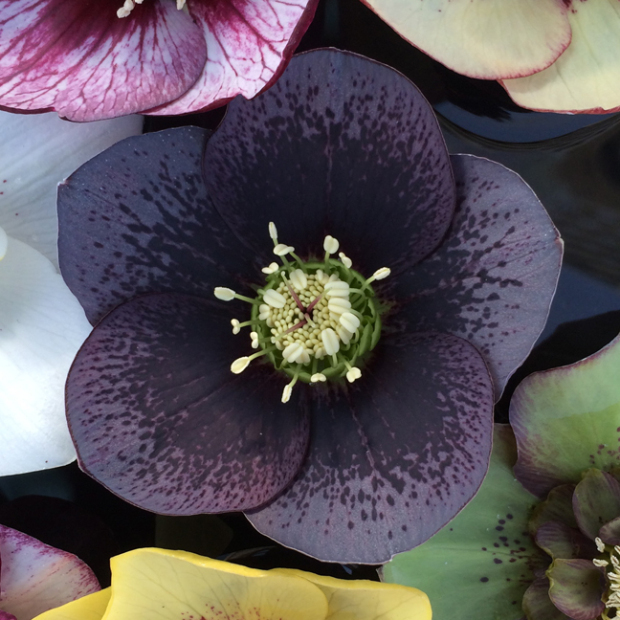 What beautiful flowers these hellebores are! I only first heard about them yesterday and now I just read your post!